HMD Global’s CMO Pekka Rentala stopped by Sydney, Australia, to announce the first local carrier partnerships for the revitalised Nokia brand and to officially unveil the new 3G-enabled Nokia 3310. We spoke to Pekka about the return of Nokia to the smartphone market and how they plan to make the once-mighty brand feel new again and in an increasingly-saturated and competitive category. Here’s what he had to say. Rejuvenating the Nokia brand is a tall order. What's step one look like? This year's been a big year for comebacks. You've had Blackberry and now Nokia. How do you go about turning that initial brand momentum into long-term growth? 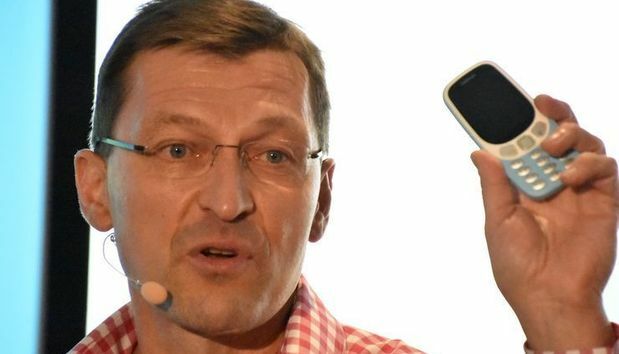 “First of all, business-wise, we have said that we want to become one of the top players in smart-mobile telephoning, which is a tall order and a big ambition but we somehow feel that we can not ask anything less from ourselves when it comes to [the] possibility to work with the Nokia brand and with [our] partners Android, Google, and Foxcom. That's where we are. And definitely, it is a journey. So this year, yes, we have come back to the market, but then of course we are still, absolutely, a Nordic challenge from Europe. You've previously talked about your partnership with Google and how important that is. Can we expect to see that partnership continue? "Absolutely. It's really part of the permanent element in our story. Android, 10 years ago, wasn't yet a mature and great experience. Nowadays, we really adore Android. We endorse it, we celebrate it. It's a great experience." “We're having really good discussions [with Google]. In fact, when I'm leaving here, I'm going to Mountain View in California to meet them in the Valley. We are having really good, intimate, close discussions, because the way we'll introduce Android and Google services is exactly how Google has intended them. We don't have any conflict. We are a good strategic partner for Google. So that brings us very close to them. Look at Google is telling themselves about it, and it's absolutely the same message. Do you expect that Google's move to swallow up HTC will complicate that relationship? "We know that there won't be any change on that. It's a separate thing, and the partnership is really blossoming and getting stronger. We are really grateful for the partnership. You may have seen, for example, that when it comes to security updates, there has been occasions where we have been introducing the security update earlier than Google. I think it's a sign of how Google treats us, really, as a partner, and [it is] very fair treatment. So we are really happy." At a previous event, your former-CEO talked about you planned to bring back the Nokia brand to all these other categories, and you didn't really want to rule anything out when it came to tablets, phablets and that sort of thing. Is there anything that you can now rule out? “The brand is really not only universal and worldwide-known, but it's also wide [enough] so that people will wonder if there will be something like that on the market. It would be fair. This year will see both Samsung and Apple raise the bar for how expensive smartphone pricing. Do you expect your top-of-the-line flagship products to eventually play in the price-bracket as the Note 8 and iPhone X? "Let me put it this way ... We are really happy about our current roster. We want to focus on that one, and we really have a great flagship product. Of course, like I said, we don't stop here. We have a couple of numbers still left, when it comes to seeing these numbers in the world." Would you say there are any parallels between the way you’ve worked to evoke nostalgia for the Nokia brand that the strategies that Motorola has been using? "Actually, to be brutally honest, I don't even know how they market those. Like I said, we try to stay laser focused on our consumers. We respect the competition, but I do think that it's very important that we don't look too much left and right, but we stay focused on the customers." Do you think HMD being a startup that's looking to the past so much makes you sort of unique? "I think that, definitely. Overall, if you look at HMD as a start-up and our partnership model, the fact that we are able to utilize a brand [like Nokia] that really is a unique brand in the technology space. There is no other brand. All brands, of course, are unique brands, but like I said, Nokia has so fine and great characteristics, which really touches hearts of people. Absolutely, I think it's fair to say that we are quite unique." In your presentation, you characterized the Nokia brand as a “European alternative”. I thought it was a really interesting way to position the product. What Finnish qualities do you see in your product line? "Let's start with the design. The design, the language. It's a really strong heritage. It has very, very long roots on the Finnish side. It took, of course, a long time to create it. Let's keep in mind that Nokia is a very old company. The design heritage didn’t start in the 1980's with phones. Before that, Nokia had designed so many other things: Television sets, even humidifiers, or rubber goods. And of course, I'm not saying that Nokia's design is coming from rubber goods, but basically, it's an equity thing that has evolved. So The design is absolutely one answer to your question." “Then I think the other thing is the whole idea of connecting people. That whole brand core, that of course has evolved over time. There is something very Finnish in that. I'm a Finn, and I resonate very well with that promise, and overall, the way we have been communicating our brand. It has been quite simple and straightforward, but intimate. You know, we Finns, as a nation I think we are an educated nation. We love nature and many other things in life. I think that it fits also very well for us that Nokia, as a brand, has never been the brand who has been dictating and telling someone that, "You need to go and do this." “Nokia brand is an enabler. It is a trusted friend who is available, and somebody who is nearby. I think that is also something Finnish [or] In a sense, Scandinavian. Many, many, many Finnish things. Of course, quality and reliability." Are there any unique Finnish words or terms that you’d use to describe the devices or what you're doing with the brand? "I think very good question. There is one Finnish word which is very special, and it's difficult to translate. It's called ‘sisu’, which means something like you never give up. You never give up. It's like a never-ending, endless energy. There's confidence, and at the same time there is a humble and modest attitude. At the same time. In the same package, you are humble and modest, you work hard, you believe in what you are doing, you believe in a long term dedication or commitment. That's sisu. I think in Nokia, and also on our journey here, there's a lot of sisu. Sisu is also needed, and I think that we have it." The 'bothie’ often gets a little bit of a chuckle from the tech press. Were there any alternative names considered for this feature? "I think ‘bothie’, it is and was the one that we came to very fast. We wanted to sound like our own [but also] bring sort-of a link to selfies so that people would realize and understand that. Of course, there is space for both. Let's keep in mind there are space for both. There are moments where a selfie is the right thing, and there are moments where bothie is the thing that really can capture both sides of the story." You've been selling sort of direct through your retail partners. Do you expect that strategy to change when Amazon expands to Australia? “I just want to say, we are very happy with our current partners. Very, very happy. We have learned so much from our trade partners, and as you heard today, we also are adding now operators, so I don't want to speculate about future. We feel so lucky that we have these partners on our board. You can get a full first look at the Nokia 3310 3G at our coverage of the official announcement event here and you can read our full review of the flagship Nokia 8 here. Does encryption really shield you from government's prying eyes?